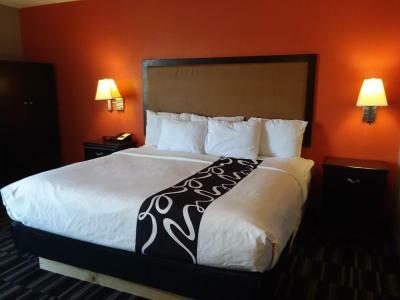 Lock in a great price for La Quinta by Wyndham Memphis Airport Graceland – rated 8 by recent guests! Booked this hotel from the reviews of past guests. However they didn’t hold true to what they said! Easy access from the freeway. Excellent Mexican restaurant nearby. Breakfast was good. Nice friendly staff. Very clean. I will stay again if I need to. Quiet and clean. Pets were in the hotel but nothing troublesome. You are able to park in a secure passcode only gated section for free. Allen at the front desk was so helpful and understanding. The room was a good size and good value for the money. Staff greeted us as soon as we walked in. They made us feel welcomed and were very friendly. The room was exceptionally clean and the bed was comfortable. We would definitely stay again if the need arises. It was a great breakfast. I enjoyed the location and the layout of the area. Everything was provided for guest to not worry about running out of good. It was great for the hotel. We are not pleased with the changes associated with the recent change of ownership. We have two major complaints. First, we have been unsuccessful in our attempt to transfer points, in spite of many hours on the computer and phone. Second, we have been loyal customers of La Quinta mainly due to its pet friendly policies and great service. Now we are required to pay a fee or worse, be informed that pets are no longer allowed. We found this out at 10 pm at a La Quinta near Cincinnati! La Quinta by Wyndham Memphis Airport Graceland This rating is a reflection of how the property compares to the industry standard when it comes to price, facilities and services available. It's based on a self-evaluation by the property. Use this rating to help choose your stay! 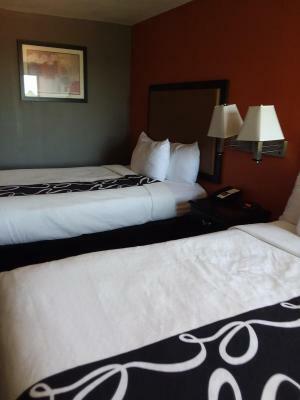 One of our top picks in Memphis.This Tennessee hotel provides a free transport service to and from the Memphis International Airport, which is 2 miles away. Guests will enjoy free property-wide Wi-Fi, an outdoor pool, and daily hot breakfast. A microwave, small refrigerator, and cable television are featured in all guest rooms. La Quinta Inn and Suites Memphis Airport Graceland provides coffee-making facilities as well. Guests will have access to express check-out and local area transport service. 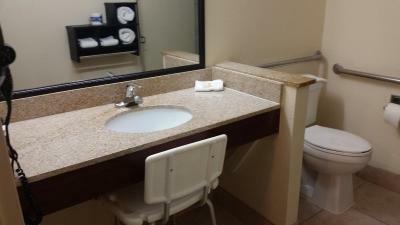 This Memphis Airport La Quinta Inn and Suites also offers laundry facilities and free on-site parking. The hotel is 3 miles from the Elvis Presley estate, Graceland, and 7 miles from The Liberty Bowl Memorial Stadium and Fairgrounds. The FedEx Forum is 10 miles away. 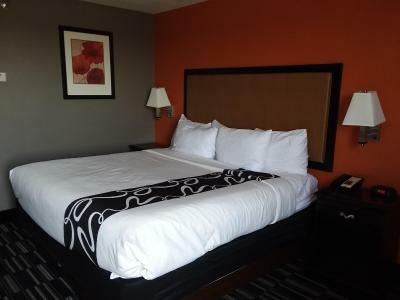 When would you like to stay at La Quinta by Wyndham Memphis Airport Graceland? 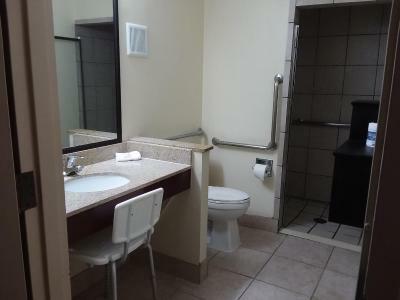 This room features a microwave, small refrigerator, and cable TV. Coffee-making facilities are also included. 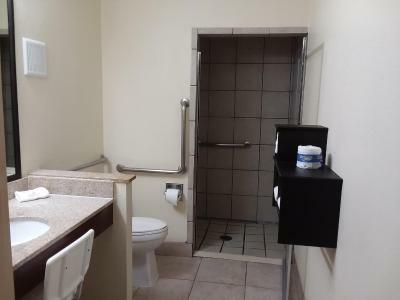 In addition to being located conveniently close to Graceland and Memphis International Airport, La Quinta Inn and Suites Memphis Airport Graceland is minutes from Medtronics, Nonconnah Industrial Part, Autozone Headquarters, UT Medical, and MAS Memphis. Rooms feature refrigerators and microwaves. Enjoy free Ultra Fast wireless internet, daily free Bright Side Breakfast, free parking, fitness and business centers, and a guest laundry. Meeting room seats 25. All rooms nonsmoking. House Rules La Quinta by Wyndham Memphis Airport Graceland takes special requests – add in the next step! La Quinta by Wyndham Memphis Airport Graceland accepts these cards and reserves the right to temporarily hold an amount prior to arrival. Please note: the free airport transport service is available from 04:40 - 00:00. The hotel needs a lot of TLC!! Someone took my necklace. I know that I left it there on the counter and the didn’t return it. Door painted on rooms very old looking beat up damaged doors. Need a little bet update , and the breakfast was not so good. Also to the attractions too much traffic and not closed. The pillows and beds were very comfortable. The fitness room was basically none functional. None of the machines were working. The facility was located next to a concrete company. The fan on the heat and air unit would not turn off, nor could the temp be changed. The breakfast was very minimal and the staff was deplorable in the kitchen. There was only one coffee urn that had coffee in it. The 4 other ones were empty. They were not busy wiping up the mess made on the counters and there were items that were not available because they were not refilled. I overheard one lady asked the attendant,”Do you have any boiled eggs? “ The attendant stated, “ We don’t have any boiled eggs today. “ The customer replied I guess that answers the question almost doesn’t it. The customer walked out. The way the line is set up everyone is running into each other trying to get your food and it is not designed well. I got my food to go because I was not going to sit and freeze because the air conditioning was up so high and came back to my room. When I checked in I gave them my Wyndham rewards number. It came back as being an invalid number. I know it wasn’t because I just used card the night before. The front desk says they’ve have upgraded their computer system and for me to call Wyndham rewards at 1-800-967-8747 for them to credit my account. I came in the room dial the number waited 25 minutes. No one ever answered so I hung up . I requested a late check out which is noon. At 9:50 AM housekeeping knocked on the door. Draw your own conclusions.